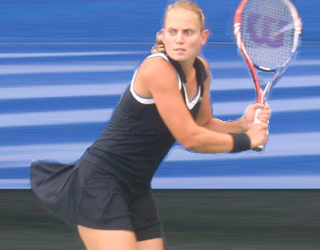 Australian Jelena Dokic, above, claimed her third-straight Challenger title in West Vancouver, August 8. The former world No.4 is riding a 15-match winning streak after beating France's Virginie Razzano (photo 2), 6-1, 6-4 in the final, to take home the $11,400 US prize money. Jelena came to Hollyburn tournament at No. 96. She paid tribute to her new coach Glen Schaap, who is emphasizing fitness. Photo 1: In the men's final, Israel's Dudi Sela overcame 20-year-old Richardas Berankis of Lithuania (photo 3), 7-5, 6-2. Sela becomes the first three-time single champion of the Vancouver Open. Photo 3: Twenty-year-old Richardas Berankis was the top-ranked junior in the world. Photo 4: A pair of veterans, Virginie Razzano, left, and Jelena Dokic. Both born in 1983 and both have once been ranked in the world's top 20. They have lately been on their comeback trail. Photo 5: Defending champion Stephanie Dubois of Laval, Que. lost to American Irina Falconi, in the quarters, 5-7, 6-2, 6-1. Stephanie is the second-ranked Canadian player behind Aleksandra Wozniak. Photo 6: Taylor Dent, this year's top ranked player, lost in the semis to Dudi Sela. Photo 7: Frank Dancevic lost to Israel's Harel Levy, 6-3, 6-4. It was a tough tournament for the Canadian men. All six bowed out in the first round. Philip Bester of North Vancouver had three match points but fell 4-6, 7-6 (8-6), 6-4 to Australian Nick Lindahl. Last year Philip made it to the quarterfinals and almost upset former world No. 8 Marcos Baghdatis. Photo 8: Peter Polansky lost to Taylor Dent, 6-3, 5-7, 6-2, in the first round but takes down world No. 15, Jurgen Melzer, a week later in a stunning upset in the first round of the Rogers Cup in Toronto, 7-6, 6-4. Photo 9: Nineteen-year-old Milos Raonic, one of the promising stars in the Canadian system, lost to American Robert Kendrick, in a close match, 7-6, 6-4, Milos a week later teamed up with Vasek Pospisil, another talented Canadian, to shock the world's top two players, Spain's Rafael Nadal and Serbian Novak Djokovic, in Totonto Masters, 5-7, 6-3, 10-8. Photo 10: American Jesse Levine lost in the quarters to Ricardas Berankis, 6-3 , 6-4. In the women's doubles final, Canadian Heidi El Tabakha with partner Kai-Chen Chang of Taiwan won the women's doubles title while the men's doubles crown went to Treat Conrad Huey of the Philippines and partner Dominic Inglot of Britain..